Welcome to Tarleton Tip Thursdays, where every week we help you harness the power of social media. Today we discuss how to separate your personal and professional profiles on Facebook. Do you have more than one Facebook profile? You may have a personal profile and also manage the page for a small business or brand name. For example, many people own small businesses that use Facebook as a marketing tool. You may want to add a comment as yourself, not as the official voice of your organization. Or you may just want to avoid having your business "like" all of its own posts. 1. Log into Facebook as usual. 2. Click the drop down arrow to the right of Home. 3. Click on your company's profile. 4. Click Edit Page and Manage Notifications. 5. Under Posting Preferences, uncheck the box that says, "Always comment and post on your page as [Company Name], even when posting as [your name]. 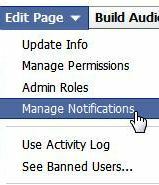 Edit, July 5, 2012: Facebook has added a new voice feature to help with this issue. Do you have a social media question? Would you like to guest post on the TSMRI blog? Thank you! I needed to figure this out ages ago! I thought by clicking "Use a (name)" it would do it but it doesn't! This is awesome!